It's been three years dear readers and while the pain of losing my mother is a wound that won't soon heal itself, I can think of no better honor than to dedicate an article to her about one of her favorite films of all time. I've mentioned it before, but my mom never did get to read any of my pieces here at the Maus. She knew I loved films and reading, but she never understood just how passionate I was about writing. Now, I've written two dedication pieces before, both of then analyzing a film and relating it back to either my mom's life or my own journey through grief. This piece will be different in that this will be purely a straightforward discussion of the film in question. 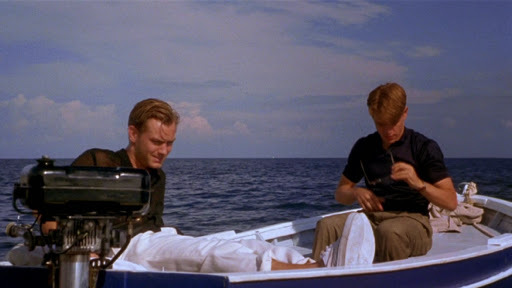 That film is THE TALENTED MR. RIPLEY. Simply put, this is one of my favorite films of all time. Not quite top 5, but easily in the top 10. It is Minghella's best film by leaps and bounds, and to be honest I don't really care for much of his other work at all. 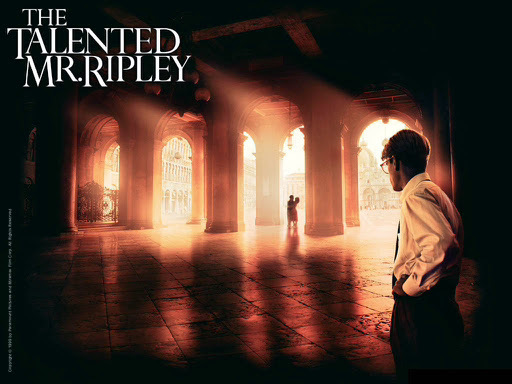 But Ripley...Ripley is bottled up brilliance that has been splattered across the celluloid universe in a wonderful melange of euro fantasy, jazz, and some Hitchcock for good measure. It is beautifully crafted with impeccable acting and from the very beginning you know you're in for something special. This is going to be a short discussion so I want to focus in on my favorite aspect of the film, the visual representation of Tom's fractured identity. The film begins with strips of film coming down to fill in the black screen. 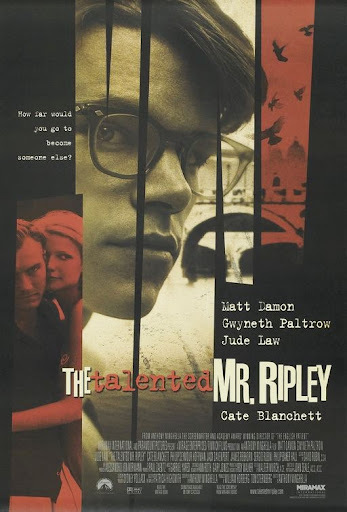 They piece together to create our anti hero Tom Ripley. All the while the camera pans around his face from light all the way to dark as we finish the opening shot with all the pieces together creating a singular shot and his face half in shadow. This music during this scene is also an opera piece representing Tom's actual tastes. So with a few minutes and some simple camera work we see a complicated literally pieces together, as well as getting a visual metaphor for his light and dark side. Simple and beautiful, a perfect beginning and it really sets the tone for everything to come. Minghella is never flashy, something's are more obviously symbolic than others but he never holds up flags while winking at the audience. The use of strips of film coming down to build a shot is used one more time, at the impetus of his journey to infiltrate the life of Dickie. This time the music is wonderful Jazz. This is the music of Dickie, and we begin to see the seeds being planted for what's to come. By using the same visual trick to build the shot of Tom in his apartment, thy was used to build Tom in the cabin, Minghella shows us just how fragile Tom's sense of identity is and how easy it is for him to construct new ones. One last thing in this scene, there's a throw away line where he's listening to Chet Baker sing My Funny Valentine and wonders whether it's a man or a woman. It's small and barely noticeable but a nice wink at the audience for not only blending identities but the sexual confusion Ripley will encounter later. There's enough mirrors here, you'd think Minghella had just spent a lot of time watching Kubrick. We see reflections in everything from bath water to pianos. And each time that reflection is either shattered or split by a splash and a crash. 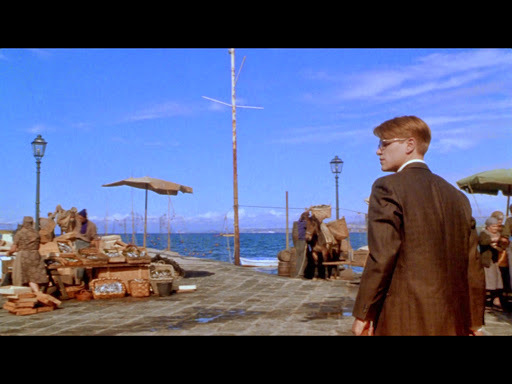 Minghella peppers these shots throughout the entire film but my favorite example of this and my favorite shot of the entire film occurs when Dickie gets a ride back to the hotel and finds Tom dressed in his clothes and dancing. Tom is immediately embarrassed and hides behind a mirror. Again it's a simple shot that tells so much about the story. First off, Tom is dressed in Dickies clothes, but not completely. He's only partially dressed as he dances around the hotel room, showing us that he isn't completely inhabiting Dickie's person just yet. 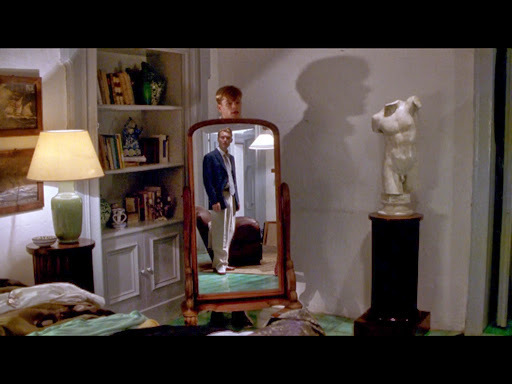 We see from the shot that the mirror reflects back Dickie's body, with Tom's head sticking out. Again a beautifully simple way to show the audience just what is about to happen. Tom is enamored with this lifestyle, but he has so little grasp on his own identity that he literally pieces together an identity from other people, resulting in this Frankenstein monster of identity. A person built with characteristics and traits pulled from who knows how many sources. We see Tom juggle all these lies and just how close he comes to letting the pieces fall. It is only then, when once again the camera begins to shift to darkness. Like most films I could go on and on. I haven't even touched on all the literary allusions from Tom's hamlet passage, to the bust form used to kill Freddie Miles. There's hints and clues everywhere in this film. Almost like Tom knows there's someone watching him and he's leaving crumbs for us to follow so he doesn't get completely lost down his rabbit hole of lies. This is one of the only movies that my mom and I both have on our favorites list. We used to rewatch it all the time and each time she elicited the same gasps at the thrilling moments and each time the movie ended she let out a simple "oh man mijo that was GOOD" We might now have shared a lot of similar tastes, but even in our bad times we always bonded over movies. We always enjoyed renting a bunch of movies making popcorn and staying up as long as we could watching movies together. Every visit, resulted in one trip to the theater. I always be sad she never saw just what movies meant to me, but I always be happy knowing that it was her who originally planted the seed of loving film. And for that I will forever be grateful. Thanks mom. I love you. One last thought - my mom...the lady who took me to see Jurassic Park 5 times in the theater, also for those who don't know, in my top 5 of all time.